German automaker Daimler chose the infamous Hoover Dam to debut its Freightliner Inspiration Truck, the world’s first licensed self-driving semi, inspired by the long anticipated Mercedes Benz Freightliner 2025. The truck officially arrived in Nevada on Tuesday night, which is the first state to allow self-driving vehicles cars and give out autonomous vehicle licenses and license plates. While Nevada has also actually licensed two autonomous Freightliners, Daimler’s truck is the first 18-wheel commercial vehicle to put the petal to the metal and demonstrate its hands-free driving skills. Tuesday's demonstration began with a driver pulling the truck onto the curved road overlooking the Hoover Dam and then simply allowed the truck's “Highway Pilot” to take over the stage. Similar to the autopilot system in a passenger jet, the truck driver can engage the Daimler Freightliner into "Highway Pilot" mode and the truck will automatically brake and accelerate based on the posted speed limits for large trucks. While Daimler representatives did compare their truck debut to “man’s first step on the moon”, they also made some important clarifications about its limitations during the demonstration. "In terms of on-highway commercial trucks, it is incorrect to refer to a ve­hicle in autonomous mode as a driverless truck. Drivers remain the boss in their vehicle because the technology ... requires the presence of a qualified truck driver with valid commercial driver's license in the cab and on the gauges." They also pointed out that there are still many maneuvers that the truck cannot make on its own, such as passing and lane changes and if the “Highway Pilot” detects difficult driving conditions such as bad weather, it will ask for the human driver to take over the wheel. 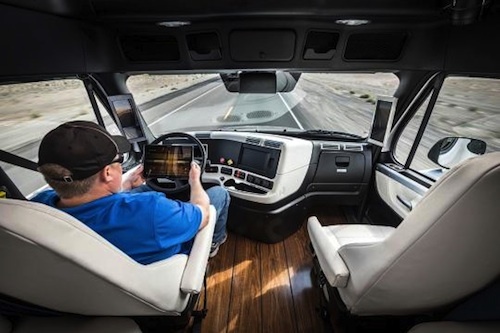 While some may be disappointed that technology has not yet been able to completely replace human truck drivers, many see autonomous freight trucks as the ideal solution for making truck drivers jobs easier, rather than being a threat to their livelihood. Anyone who drives a semi knows that it is tiring and dangerous work, proven to leave many truck drivers chronically sleep deprived. In fact, these very issues are part of the reason why commercial truck drivers are becoming harder and harder to find. Last year alone, the trucking industry reported nearly 35,000 unfilled jobs. If these “smart” trucks are able to take a load off the driving and keep everyone in line with the rules of the road, perhaps they could really make truck drivers’ job a lot easier and even make it a more attractive profession again. But since Nevada is the only place that Daimler's Freightliner Inspiration is licensed to drive, the salvation of a self-driving semi is only wishful thinking until the other US states decide to get on board. As a truck driver, do you see self-driving semis as improving your job or creating more potential problems? Now it's not even steering wheel holders. Boy just wait till 4 wheelers start pulling out in front of them and cutting them off. I don't think these engineers ever actually operated a truck. No. A driver should ALWAYS be at the wheel when a vehicle is moving. Let me break this down for you. . The FMCSA was designed to remove the driver from the self driving vehicle. Look forward. . The infrastructure is already there.. it's called toll roads. Those trucks only need to drive 55 and go from point a to point b .. imagine a self driving truck set up by a yard jockey that is sent across the toll road to a staging facility (they already have staging yards to break down the turn pike doubles or triples) and from there a city driver picks it up and takes it the last leg into the city. The will eventually get rid of long haul drivers and flood the market with drivers that will force down wages of city drivers and create a whole new class of dependant welfare collecting citizens that can't pass a physical. . That's the big picture. .
Now companies will have more reasons to pay less. Now let's see it on the north end of the Jersey Turnpike. I've said for years they were removing the driver more and more. Calm down folks! It's only a hyped up cruise control!